The Milky Way, or Melkweg, is a concert venue in the centre of Amsterdam. It is located near the Leidseplein, a prime nightlife center of Amsterdam. It is housed in a former warehouse and the building has several functions, whereof the most important is hosting rock and pop music concerts. 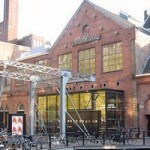 The Melkweg is run by a non-profit organisation that has existed since 1970.